Aggressive, melodic, and extremely emotive, Freddie King was one of the most expressive guitarists the blues has ever known—and he did his formative work on a Gibson Les Paul. Although he was born in Texas, King became synonymous with hard-driving electric Chicago blues, and received a thorough grounding in his trade while combing the Southside clubs and catching the great blues artists of the late ’40s and early ’50s after his family moved to the Windy City in 1949 when he was just 13. He always retained a certain Texas twist to his playing, though, and that might partly be credited with his originality amid a crowded blues field. King had started learning guitar at the age of six, and by the early ’50s he was trying hard to forge a career in his own right, while also working a “day job” in Chicago’s steel mills. Having been born Frederick Christian, Freddie is thought to have changed his stage name to “King” to benefit from associations with B.B. King (oddly, he also used the spelling “Freddy” up until 1968, and “Freddie” after). By the time King was experiencing some success in his own right, he was doing it with a ’54 Les Paul Goldtop; although he eventually moved over to other ES-335-type Gibsons, he is often most closely associated with the seminal P-90-loaded Les Paul. 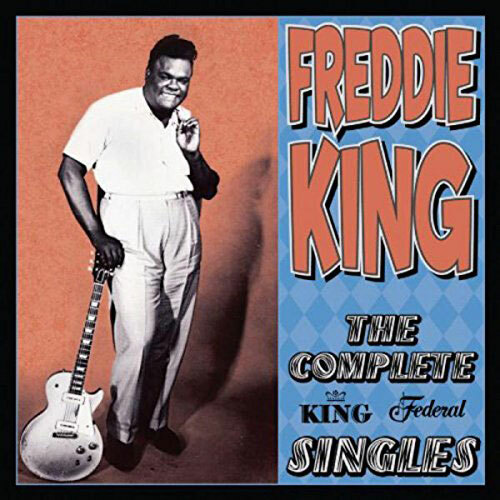 False starts and failed attempts to launch a recording career throughout much of the ’50s had Kind floundering for a time, but he finally logged his first two proper studio albums in 1961, and he sported his Goldtop on the covers of both of them: Freddy King Sings The Original Hits, and Let’s Hide Away And Dance Away With Freddy King. It was the latter that inspired young English guitarist Eric Clapton to seek out a Les Paul of his own, and, as a result, arguably spawned the British blues-rock boom. Later, King would help initiate successive generations of bluesers and blues-rockers to the craft, touring with fellow Texans ZZ Top, and offering advice to a young Stevie Ray Vaughan. Throughout the middle and latter parts of his career, King made good inroads with young, white audiences more often associated with the rock and blues-rock scenes. He performed alongside Led Zeppelin in 1969 at the Texas Pop Festival, and around the same time was signed to Leon Russell’s label, Shelter Records. With his aggressive playing style, hybrid fingers-and-thumbpick technique, and eviscerating tone, Freddie King’s guitar work was always hard to miss. He was a big man, and put plenty of weight behind his touch—a momentum that translated viscerally through his Les Paul Goldtop and into the amplifier. The rigors of touring—and, perhaps, King’s tendency to drink a bloody Mary rather than eat a square meal while setting up for the show—took their toll on the guitarist’s health, and he died of complications from chronic ulcers and pancreatitis in 1976 at the age of just 42. At his posthumous induction into the Rock And Roll Hall Of Fame in 2012, King’s daughter Wanda talked about having broken her father’s Les Paul Goldtop while running around the house with her siblings, perhaps the event that inspired his move to Gibson semi-acoustic electrics.